Peter Nicholas Marchi, Sr., 86, passed away peacefully at his home surrounded by his loving family on January 30, 2019. He was the devoted husband of Carmela (Bazzano) Marchi for over 67 years. Born July 21, 1932, in Sandisfield, MA; the son of the late John and Pasquelina (Calabrese) Marchi. Peter was a member of Engine 1 Winsted Volunteer Fire Department for many years. 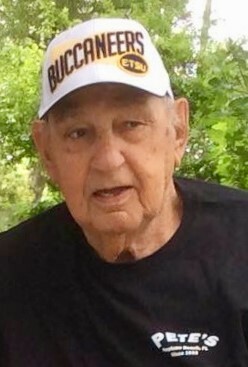 He played semi-pro football with the Pond Hill boys, was a loyal Dallas Cowboy fan, enjoyed camping, fishing, woodworking, spending time in Florida, watching his grandchildren’s sporting events and was relishing in his retirement from the State of Connecticut DOT since 1985 after 30 years of service. Peter enjoyed a full life and devoted himself to his cherished family and friends. A sincere and genuine man that never took and gave unconditionally. Always there with a helping hand and a listening ear with a warm and welcoming quality that touched everyone blessed enough to have known him. In addition to his wife, he is survived by his children Peter Marchi, Jr., Gail Gordon, Kathy Fallon (Richard) and John Marchi (Michele), as well as his grandchildren Robert Marchi (Holly), Michelle Fedorowicz (Martin), Tyler Marchi (Maribeth), Adam Marchi, Matthew Harrington, Ryan Fallon, Kyle Marchi and Logan Marchi and five great grandchildren, his brother John Marchi (Doris) and his sisters Angie Lovetere & Esther Chirico, his sisters-in-law Dorothy Marchi, Joan Berwick (Glen) and his brother-in-law Joseph Bazzano (Denise) along with several nieces and nephews. Peter was predeceased by his son Robert Marchi, his grandson Eric Crossman, his son-in-law Gary Gordon, his brother Frank Marchi and his sister Marion Raydenbow. Friends may call on Saturday, February 9th from 11:00 am to 1:00 pm at Cook Funeral Home, 82 Litchfield Street in Torrington, with a Funeral Service to be held at the conclusion of calling hours, at 1:00 p.m. at Cook Funeral Home. Burial will be in the spring. In lieu of flowers the family asks that you donate to the charity of your choice. Condolences may be sent to Peter’s family at www.cookfuneralhomect.com.